In stock. Order in the next 51 minutes and it will go out today! 1. Push a sheet of tissue paper into your closed fist.2. On top of the tissue, you place a small green ball. Make a magical gesture, and...3. The tissue has transformed magically into a delicious looking shumai dumpling! Tissue paper transforms into a dumpling! This magic effect is as much about the laughs as it is the surreal surprise ending! 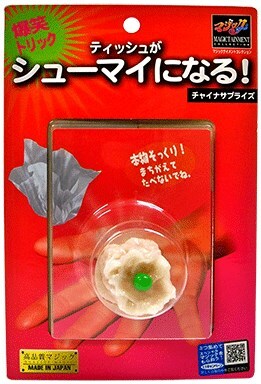 You magically transform a bunched-up sheet of tissue paper into a shumai dumpling. The gimmick is a perfect replica of a real shumai, and has been specially manufactured for this trick, through the same process used to create restaurant-quality food samples. With this gimmick in hand, you will be the center of attention wherever, and whenever, you choose to perform.